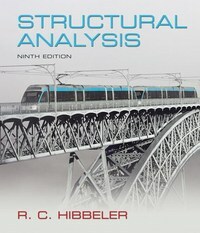 Structural Analysis 9 Edition Structural Analysis is intended for use in Structural Analysis courses. It is also suitable for individuals planning a career as a structural engineer. Structural Analysis provides readers with a clear and thorough presentation of the theory and application of structural analysis as it applies to trusses, beams, and frames. Emphasis is placed on teaching students to both model and analyze a structure. Hibbeler's problem solving methodology, Procedures for Analysis, provides readers with a logical, orderly method to follow when applying theory. Teaching and Learning Experience To provide a better teaching and learning experience, for both instructors and students, this text provides: Current Material: To keep your course current and relevant, the Ninth Edition includes new discussions and a new chapter. Problem Solving: A variety of problem types, at varying levels of difficulty, stress practical situations encountered in professional practice. Visualization: The photorealistic art program is designed to help students visualize difficult concepts. Review and Student Support: A thorough end of chapter review provides students with a concise tool for reviewing chapter contents. Triple Accuracy Checking: The accuracy of the text and problem solutions has been thoroughly checked by three other parties.